We store all relevant data in Google BigQuery and the whole task is basically to extract build results from the storage and present it in clear and simple way. Quite trivial. What made this task interesting is that recently I started to pay close attention to distributed applications and microservices in particular. Instead of having a big monolithic app, we divide it into smaller logical services, that work independently from each other and communicate via some lightweight protocol, like HTTP. UI page should be secured with login and password. The fastest way for me to do that is to make it Node.js application. So there’re two distinctive cooperating services making an app: one data service and one presentation service, which have different requirements to language and runtime, and one of them is going to be used by somebody else. Sounds like a definition of microservices. I wrote data service with ASP.NET Core (first ASP.NET application I wrote in years). 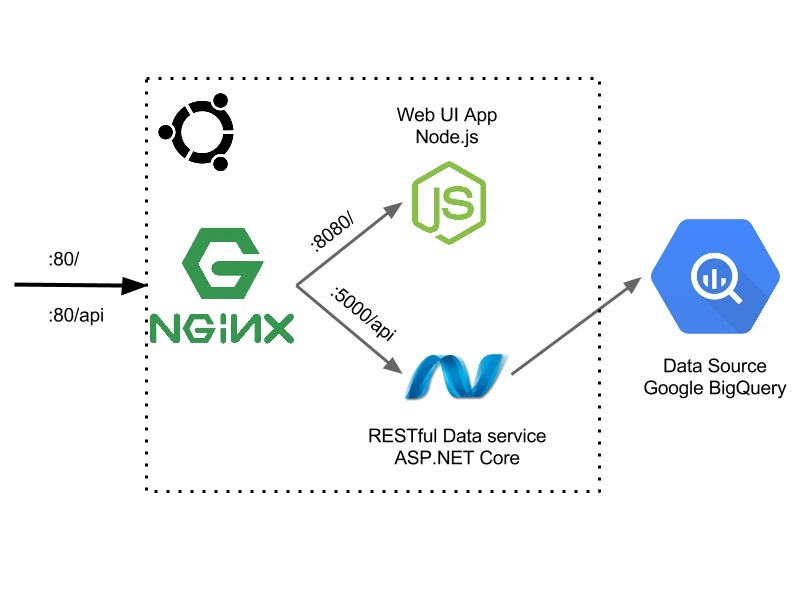 It talks directly to Google BigQuery, holds internal cache and exposes itself to the world using RESTful API: GET /build , GET /build/master , etc. Obviously, such simple app doesn’t require microservice architecture. But because it was a side project, I could safely choose it for small experiment, and honestly I’m happy with results. Firstly, UI service doesn’t expect that data service will be always available, and because of that UI is inevitable designed to be offline friendly or stay functional while data service is temporarily offline. Secondly, I simply can bring Node.js offline for maintenance, and it has absolutely no adverse effect on data service. No downtime, no expensive cache rebuild operation, nothing. If there were another app using the service, it wouldn’t notice anything. And that makes perfect sense: if I want to fix one part of application, I don’t have to bring everything down. Finally, because I made few stupid mistakes in data service, I have to restart it from time to time. And guess what, nobody noticed. UI is that independent. I really enjoyed such approach. Different components use different languages and tools they need, service maintenance is trivial and flexibility is phenomenal. At least for small side projects.